Every time we go to VA (which seems to be all the time these days) we cross over the Woodrow Wilson Bridge, as it connects the states. It's only a half our away from us! We also love visiting National Harbor. I'm looking forward to exploring it this winter. So, what are you doing this weekend? If you don't have plans, Christmas at Gaylord National begins November 19th and goes until January 1, 2017. If you already have plans, scratch them. You don't want to miss out on the opening weekend! Fred has told me that he's been there, and everything is spectacular. It takes 30 days to transform the 2000 room hotel into this winter wonderland! Can you imagine watching that take place? Be sure to check the dates for any activities you decided to do! Within its new Christmas Village, visitors will enter Gaylord National’s most famous frozen attraction, ICE! presented by Pepsi, featuring a new theme of Christmas Around the World. More than two million pounds of colorful ice is hand-carved by artisans from Harbin, China to illustrate scenes celebrating the world’s diverse cultural traditions. The 9 degrees walk-through exhibit will showcase holiday traditions from Germany, the United Kingdom, Mexico and more. 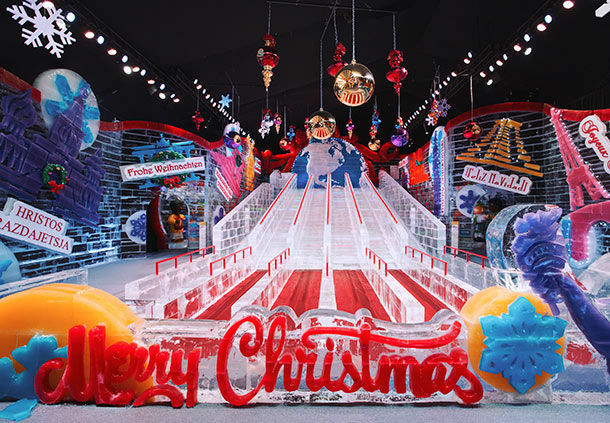 Adults and kids alike can enjoy two-story ice slides, an enchanting Parade of Toys, live ice carving by master artisans and interactive photo opportunities including sitting in Santa’s sleigh – all experienced with a provided blue parka. ICE! featuring Christmas Around the World is open daily from Saturday, November 19, 2016 through January 1, 2017, excluding December 5, 6 and 7. Tickets start at $29* for adults ages 12 and older and $21* for children ages 4 to 11 on value days; and $36* for adults and $29* for children during general admission. Kids 3 and younger are free. Military and group ticket pricing are available. Hours vary and can be found at www.ChristmasOnThePotomac.com. 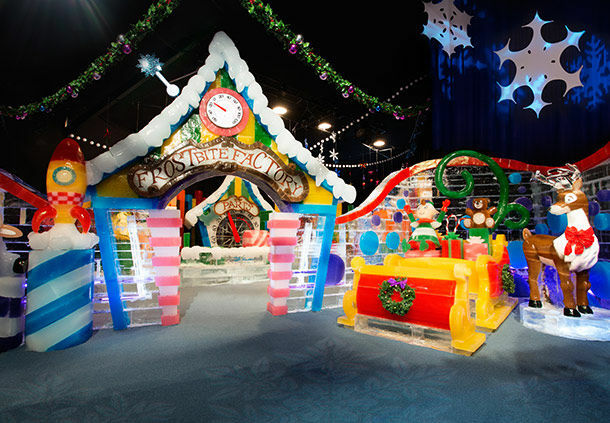 To experience unlimited Christmas fun, visitors can purchase a Play All Day Pass that includes one admission to ICE! featuring Christmas Around the World, the Gingerbread Decorating Corner experience, admission to three holiday rides – including the Potomac Express Train, The Elf on the Shelf Scavenger Hunt and a cup of hot cocoa. The package costs $59.45* for adults ages 12 and older and $59.44* for children ages 4 to 11. Kids ages 3 and younger are free. The Washington, D.C. area hotel offers additional Christmas events and activities all season long with nightly holiday laser light shows, dining events and more. New this year, guests can dine with their favorite Peanuts characters at Breakfast with Charlie Brown and Friends. This one-of-a-kind, interactive character breakfast includes a delicious breakfast with Peanuts-themed dishes and tableside visits from Peanuts characters. During the meal, guests can pose for a photo with Charlie Brown and the Gang as a keepsake from the experience. The character dining is available for breakfast on select dates. Photographs are an additional fee. Cost for this experience is $39.99* for adults ages 12 and older and $26.99* for children ages 4 to 11. Kids ages 3 and younger are free. 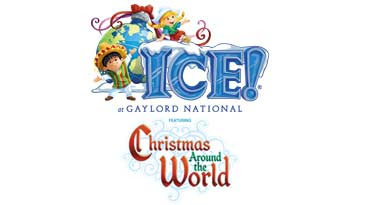 Check out all of the fun Gaylord National has in store for your family this Christmas season! If you take your family, be sure to show me any photos you share by tagging me on Instagram! I'm @MimiBakerMN and I'd love to see all of the fun you're having. Where do you like to visit when you celebrate the Christmas season? What a fun place! I love Charlie Brown and my little one is starting to also, that breakfast would be amazing! Christmas at the Gaylord in the National Harbor is truly stunning. We've only experienced it once, but I hope to do it again when we return to the states. This looks like so much fun. I love to enjoy themed events like this one during the holidays. I love to visit Rockefeller Center in Manhattan during the holidays. This is so fun! As little girls we loved to get dressed up and see the Nutcracker. There are so many wonderful traditions to get in the holiday spirit. Beautiful! I would love to see Christmas fest at National harbor. This looks so exciting. I will be in Thailand during Christmas. Unfortunately we don't have white Christmas in this part of the world. Wow, that is such an awesome experience! I've always wanted to see the shows at Christmas, but I never have. I had JUST read about this and was going to do some more research on it. My family is headed to Orlando in three weeks. I'll have to check it out. Any discount coupons anywhere? LOL, you saw the Virginia one. There is evidently one in Florida, too! Wow! That place looks amazing. I wonder what Peanuts themed food is. I am picturing popcorn and jellybeans. LOL! Wow what a cool event! I'd love to walk around to see the around the world exhibit. That's so cool that the ice is carved around the world and I guess shipped in. I bet it's gorgeous in there! 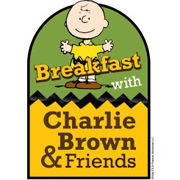 I would love to experience this kind of event, especially with Charlie Brown and his friends there. It looks like a lot of fun. We're going to a festival of lights at Moody Gardens in Galveston, TX this year for the first time. I used to live in Maryland, and never made it here. But, I just realized we have one in the Smoky Mountains too! I'll have to check it out! We have a Christmas attraction at the Orlando Gaylords and I want to go so bad! I know they have an ice slide that sounds so cool! Omg we are going to the Gaylord in Grapevine this weekend!!! My daughter cannot wait to go & honestly either can I!!! Now that my kids are getting older I'm dying to take my kids to see something like this! I can't wait to start making fun Christmas memories with them! Wow, that really looks amazing - that is a great way to start the Christmas season! It looks spectacular! I love the look of this. I love all things Christmas. The build a bear workshop sounds super fun!